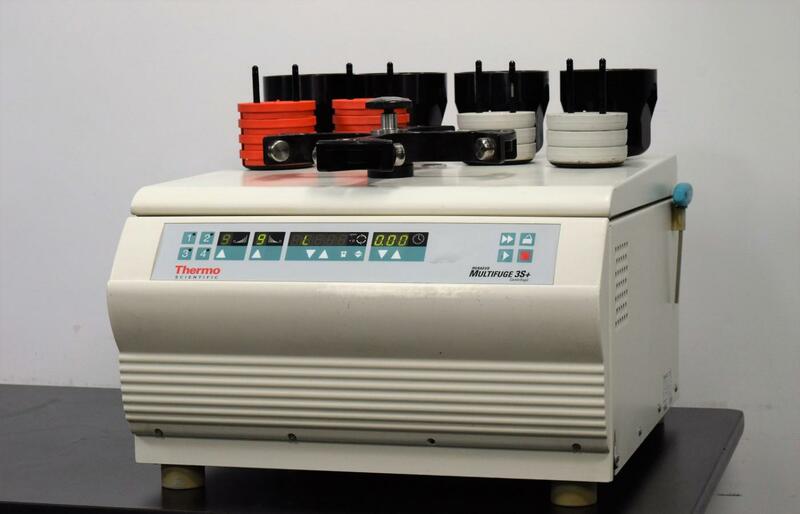 Thermo Electron Multifuge 3S Plus Centrifuge with Rotor - Buckets and Inserts . New Life Scientific, Inc. Durable and Dependable, this centrifuge is ready to spin. Our technician confirms that the centrifuge purrs right along without any issues. He tested the max/min acceleration/deceleration, used the pulse mode and did some light maintenance on the centrifuge display so it is nice and bright. This centrifuge is ready to go to work. This centrifuge reaches 4,150 RPM, the max for this rotor in this centrifuge. This centrifuge supports both research and clinical separation needs. It will support the new carbon fiber rotors from FIBERLite that will provide an advanced alternative to traditional metal rotors. New Life Scientific is no stranger to centrifuges. Over the past four years, we have dealt in and worked on a wide variety of benchtop and floor centrifuges from the top manufacturers, including Beckman, Sorvall/Dupont/Thermo, and Eppendorf. When you buy from us, you’re not just buying a centrifuge. You also gain a resource for after-sales support for any questions or issues that may arise, even after your warranty expires. We realize that buying a second-hand instrument can be unnerving, therefore we offer a 90-Day Warranty to protect you against any equipment failure or defects. If anything goes wrong, our in-house support is only a phone call away. *Max depth calculated using the number of adapter plates included with this centrifuge.